Microsoft announced this week that its popular note taking app OneNote is now available free on multiple device platforms, online, and even the Mac. 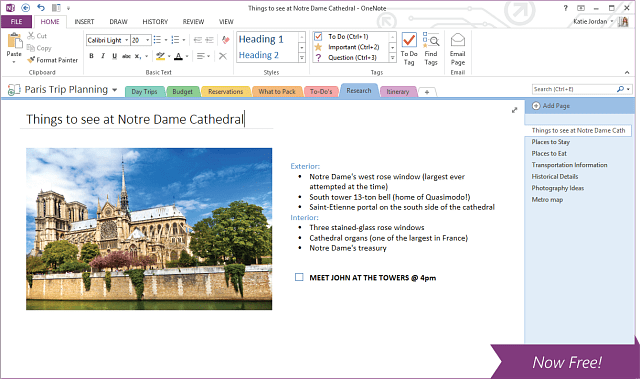 Microsoft announced this week that its popular note taking app OneNote is now available free on multiple device platforms, online, and even the Mac. This comes on the heels of it recently being available online via OneNote.com and Office.com. If you take notes with OneNote, now you can truly access them everywhere and on any device. Other cool features of the OneNote service included in the post is OneNote Clipper for saving full web pages with a click, me@onenote.com that allows you to email notes to OneNote, and Office Lens for capturing documents and Whiteboards with your Windows Phone. Office.com replaces Office Web Apps and there you can use all online versions of Office products. And now, OneNote is free to everyone via OneNote.com. It’s been available for users of Windows 8 as a Modern app and Windows Phone, and the Web. Staring Monday of this week it’s free to users of older versions of Windows too, on any device, including a free version for Mac users who can download it from the Mac App Store. The OneNote app is available for the iPhone, and we have an article that will help you get started with it. 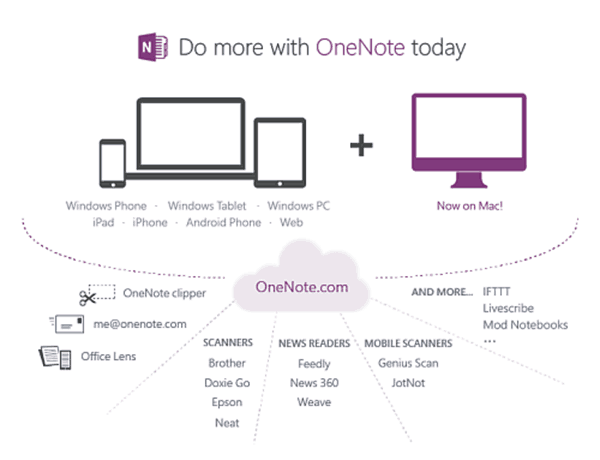 This is exciting news for OneNote users, especially those who use Macs at home or the office. This should also put the screws to the free note taking app Evernote – which is available virtually everywhere for free too. But more importantly, does this mean the company is getting us one step closer to MS Office for iOS? Honestly for me, it’s not about the OS, it’s always been about the apps and this update is a huge win for those of us who don’t want to be restricted to a specific OS. Onenote was one of the reasons I never pulled the trigger to use a Mac at work in the past. This is huge news (at least for me)…. Now all I need is a version of Outlook that’s on-par with the Windows version. How does this online access to OneNote handle OneNote folders that are password protected? It’s not a problem accessing password protected folders/sections from the Web Client. It works without an issue, just tested it. Just remember, password protected sections are not included in searches unless you first unlock it. How is this different to OneNote that comes with Word 2007 and Word 2010? And, if it is different, can it be installed alongside OneNote that packaged with Word 2007/2010? However all Core OneNote capabilities are available in the free version.